Diabetic Retinopathy Treatment India offers information on Diabetic Retinopathy Treatment in India, Diabetic Retinopathy Treatment cost India, Diabetic Retinopathy Treatment hospital in India, Delhi, Mumbai, Chennai, Hyderabad & Bangalore, Diabetic Retinopathy Treatment Doctors in India. 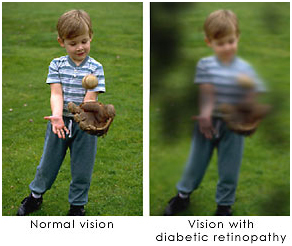 Diabetic retinopathy is a complication of diabetes that is caused by changes in the blood vessels of the retina. When blood vessels in the retina are damaged, they may leak blood and grow fragile, brush-like branches and scar tissue. This can blur or distort the vision images that the retina sends to the brain. In the early stages of diabetic retinopathy, Argon Laser Photocoagulation is used to control the disease and maintain the existing vision. Depending upon the severity of the disease each eye may be given One to Four sittings of Laser treatment. At this earliest stage, microaneurysms occur. They are small areas of balloon-like swelling in the retina's tiny blood vessels. Many more blood vessels are blocked, depriving several areas of the retina with their blood supply. These areas of the retina send signals to the body to grow new blood vessels for nourishment. At this advanced stage, the signals sent by the retina for nourishment trigger the growth of new blood vessels. This condition is called proliferative retinopathy. These new blood vessels are abnormal and fragile. They grow along the retina and along the surface of the clear, vitreous gel that fills the inside of the eye. By themselves, these blood vessels do not cause symptoms or vision loss. However, they have thin, fragile walls. If they leak blood, severe vision loss and even blindness can result. Often there are no symptoms in the early stages of the disease, nor is there any pain. Don't wait for symptoms. Be sure to have a comprehensive dilated eye exam at least once a year. What does diabetic Retinopathy causes ? Blood vessels damaged from diabetic retinopathy can cause vision loss. If remains untreated it may lead to severe diseases such as Glaucoma and Ratinal Detachment. Patients with diabetes are more likely to develop eye problems such as cataracts and glaucoma, but the disease’s affect on the retina is the main threat to vision. Most patients develop diabetic changes in the retina after approximately 20 years. The effect of diabetes on the eye is called diabetic retinopathy. scatter laser treatment may still be possible, depending on the amount of bleeding. Proliferative retinopathy is treated with laser surgery. This procedure is called scatter laser treatment. Scatter laser treatment helps to shrink the abnormal blood vessels. Your doctor places 1,000 to 2,000 laser burns in the areas of the retina away from the macula, causing the abnormal blood vessels to shrink. Because a high number of laser burns are necessary, two or more sessions usually are required to complete treatment. Although you may notice some loss of your side vision, scatter laser treatment can save the rest of your sight. Scatter laser treatment may slightly reduce your color vision and night vision. Scatter laser treatment works better before the fragile, new blood vessels have started to bleed. That is why it is important to have regular, comprehensive dilated eye exams. Even if bleeding has started, If the bleeding is severe, you may need a surgical procedure called a vitrectomy. During a vitrectomy, blood is removed from the center of your eye.